Depicted in shades of blue and cobalt, a floral nosegay centers this delightful dish while flowers surround it. Gorky González creates an exquisite plate for display or as serveware. 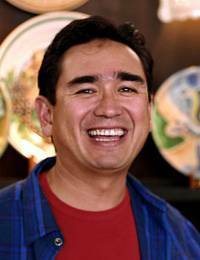 A master of Mexico's colonial Majolica ceramics, he recreates designs from bygone centuries. González signs his work 'AT,' for alfarería tradicional (traditional ceramics).